Ken Kwapis (TV’s The Office) worked with both John Krasinski and Drew Barrymore in the dramedies LICENSE TO WED and HE’S JUST NOT THAT INTO YOU. Now the filmmaker brings his favorite stars together for BIG MIRACLE, an environmental feel-gooder about a multinational effort to free a family of California Gray whales trapped under ice in Point Barrow, Alaska, in October 1988. 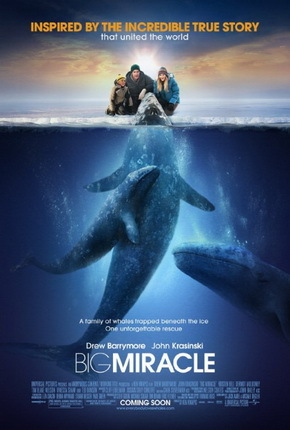 Based on the real-life “Operation Breakthrough,” and utilizing a script adapted from the Tom Rose book Freeing the Whales, BIG MIRACLE is less about the Cetaceans themselves than the improbable chain of events and culturally at-odds people who set aside their differences to liberate them. Krasinski is Andrew Carlson, an enthusiastic rookie TV newsman paying dues on assignment in the northernmost city of the United States, where the temperature drops so low you might need your buddy to lick your eyes to keep them from freezing shut. Andrew’s finished with fluff pieces about avocadoes and is saying his goodbyes to his Inuit hosts when quite literally the biggest story of his young career breaks—right through an pack ice just off shore. A baby Gray whale and its parents have become cut off from open sea by a glacial wall and must hammer through the surface ice with their snouts to breathe. If the gentle giants relent, their “spy-hop” pool will freeze over and the whales, locked beneath, will drown. Andrew’s news feed goes viral, prompting a visit from headstrong ex-girlfriend, Rachel Kramer (Barrymore), a Greenpeace activist devoted to stopping Big Oil from drilling Alaskan wildlife preserves. Given her experience and passion, Rachel becomes the unofficial mission commander on site, where the newly-christened Fred, Wilma, and Bam-Bam draw increasingly more fans. But she’s also got one eye on Drew, who’s been getting cozy with hottie news anchor Jill (Kristen Bell) in spite of (or perhaps because of) a lingering attachment to his stubborn, tree-hugging paramour. Meanwhile, the Inupiat locals decide to pitch in to the rescue attempt even though Chief Malik (John Pingayak) would just as soon harvest the whales for their meat. Malik and his ancestors have hunted the seas for centuries, respecting and praying to their watery “garden”—but the elder knows the media wouldn’t understand if his tribe butchered the mammals. The “outsiders” would only see blood, and the TV cameras would portray them as barbarians to the “civilized” world. Malik’s grandson Nathan (Ahmaogak Sweeney) is torn between old and new cultures; he’s a curious eleven-year old who suffers the sage’s teachings while listening to Def Leppard tapes on a Sony Walkman. He appreciates his heritage but, like Drew, wants something more for himself. Rachel persuades a reluctant governor to dispatch the National Guard to the hostile Arctic environs. Braving the unforgiving elements, a crusty helicopter pilot must tow a hover-barge to Barrow to dismantle the whales’ icy prison. Money-minded oil magnate D.W. McGraw (Ted Danson) lends his name and dollars to the cause, knowing there’s nothing to be gained (and goodwill to be lost) by quibbling in public with the determined Rachel. Behind the scenes, a pretty White House press secretary is tasked with making the not-so eco-friendly Reagan administration look good during the crisis, even if doing so means calling the Russians for help at the height of the Cold War. Even a couple of Bob and Doug MacKenzie-type entrepreneurs from Minnesota get in on the action, bringing homemade deicers to Barrow to thaw the whales’ shrinking air hole while Malik’s group carves an egress to the sea with chainsaws. Kwapis does commendable job distilling the whales’ predicament and the resulting human subplots into a coherent, crisp-looking film. Shot on location at the top of the planet, the movie captures the unbearable frigidness and its affects on people and machinery. Few special effects are needed, even with the gigantic animals. The editors also interweave actual T.V. bulletins (with equal time for Peter Jennings, Dan Rather, Tom Brokaw, and Connie Chung) into the narrative, lending a “this really happened” vibe to the action. Krasinski and Barrymore seal the deal with their earnestness. The grown-up “Gertie” is especially likeable as the deliciously annoying crusader who pisses everyone off until they can’t help but lend a hand for fear of vilification. Those who enjoyed SOUL SURFER and DOLPHIN TALE will take to the marine melodrama of BIG MIRACLE, but some youngsters may be distressed by the whale’s plight (The mammals’ snouts are bloodied after repeated pokes at the sharp ice). Even so, it’s a heartwarming picture (despite the brutal temps) with a message that resonates today, what with global warming at the fore. Be sure and stick around for the credits for archival footage of the real people behind “Operation Breakthrough,” including Drew and Rachel. It occurred to me while watching the film that someone else probably deserves a little credit for the camaraderie on display in BIG MIRACLE: Leonard Nimoy. After all, it was Mr. Spock who wrote and directed whale-centric sequel STAR TREK IV: THE VOYAGE HOME, which brought our blubbery brethren to public consciousness a couple years prior to the Barrow incident. Live long and prosper, whales! 2 ½ out of 4 stars.